Marion Zoological develops and manufactures specialty, life-enriching foods for rare and endangered species of animals. Since 1985, these formulated foods and innovative manufacturing methodologies have resulted in improvements to the captive conservation and propagation of over two hundred animal species. Prior to this time, many of these species would not survive on their own either in captivity or in the wild. Now, with the success of Marion Zoological foods, developed and formulated in close collaboration with exceptional researchers, scientists, and animal caregivers, many of these species are now considered to be self-sustaining. 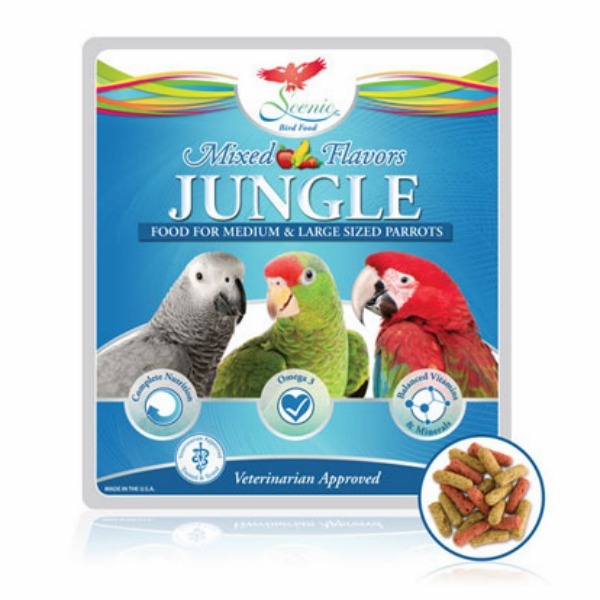 Scenic™ Bird Food is a complete formulated diet for exotic hookbill and softbill birds such as macaws, cockatoos, parrots, lories, budgies, mynahs, toucans, and finches. Scenic Bird Food has improved the feeding protocols, nutrition, health, and reproduction of rare and endangered birds maintained in captivity throughout the world, including the Black Palm Cockatoo (San Diego Zoo) and Buffon’s Macaw (Amigos de las Aves). Available in a variety of shapes, flavors, and sizes, Scenic Bird Food can be fed to a myriad of different bird species at all stages of life. Choose Hand Weaning and Hand Feeding products for baby and juvenile birds or popular products like Jungle Food for larger hookbills like Macaws. Scenic Bird Food was begun in 1986 by a collaboration of exceptional animal scientists and caregivers. Scenic Bird Food designs, manufactures and distributes quality bird foods for every stage of life. Scenic Bird Food was the first to pioneer the use of extrusion technology and other healthy processes to manufacture foods for exotic birds. Through scientific research and rigorous product testing, Scenic Bird Food has improved feeding protocols, nutrition, health, and reproduction of rare and endangered birds maintained in captivity throughout the world. Working with a collaboration of exceptional researchers, scientists, and caregivers, Scenic Bird Food has introduced products that have resulted in better feeding protocols, better nutrition, better health, improved reproduction, and improved ease of use and economy. Scenic Bird Food was originally developed for large mixed aviaries. One three-year study involved 400 birds representing almost 670 captive species. At the conclusion of this study, the results were presented to the Association of Avian Veterinarians and the Association of Zoo Veterinarians in 1986. In 1985 Scenic Bird Food became the first extruded diet available to the public and was widely advertised in Bird Talk, Bird World, Bird Breeder and many other magazines including the Journal of Wildlife Medicine. For over 30 years, Scenic has been the name to trust in feeding exotic birds. 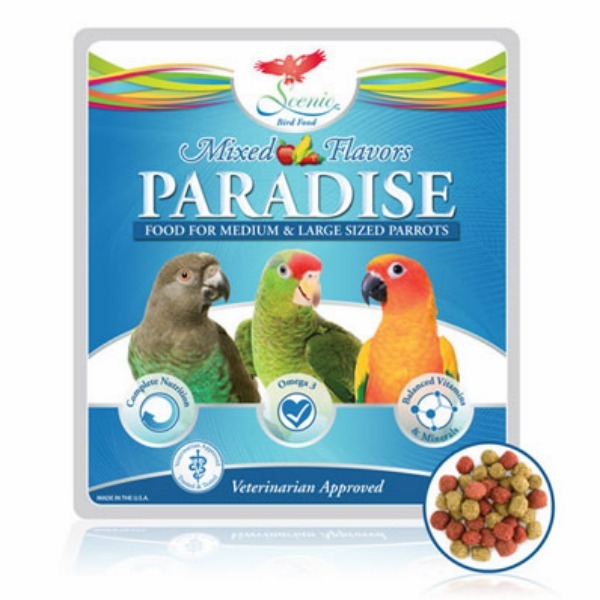 Welcome to Scenic Bird Food—we develop and manufacture foods for macaws, cockatoos, parrots, lories, budgies, mynahs, toucans and finches. This is all we do. We are solely devoted to the feeding and care of exotic pet birds. We distinguish ourselves in many ways. We have developed our bird foods over a long period of time and carefully improve them as new research studies become available. We continuously study the eating behaviors of birds in captivity as well as in the wild to learn new ways of meeting their social and nutritional needs. As a result, Scenic Bird Food has been fed to many multi-generation and diverse species of birds with great success. Next, our foods and feeding techniques provide diverse menus that match bird behavior in the wild. And best of all, our foods are based upon published scientific research. Give us a chance to show you how our foods and techniques result in healthier and happier birds, and bird owners. As always we are grateful to the professional bird owners and scientists who have helped us develop these foods and techniques.